OPEN FLOOR PLAN WITH OVER $174,000 IN UPGRADES! 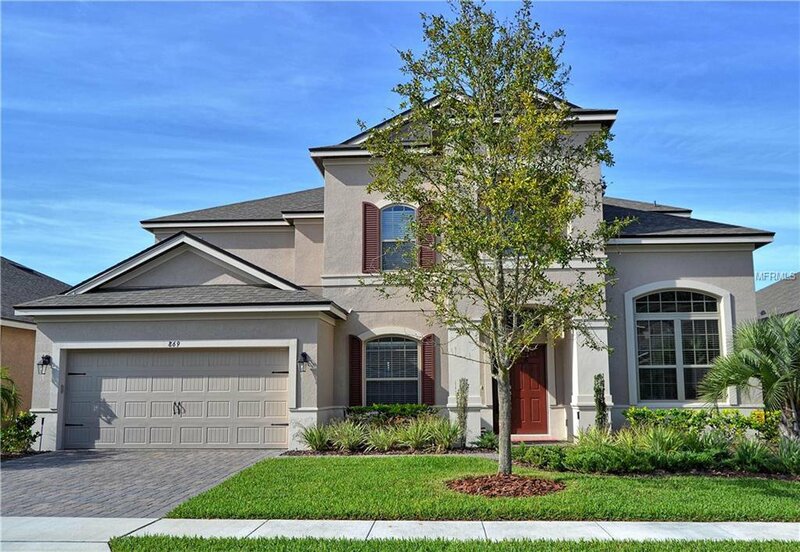 Exquisite 4 bedroom, 3.5 bath, additional OFFICE, BONUS/GAME ROOM, THEATER/MEDIA ROOM, 3 CAR TANDEM GARAGE, large indoor utility room, CUSTOM ENCLOSED SALTWATER POOL/SPA w/ EXTENDED BRICK PAVED LANAI home just built in 2014! This exceptional home boasts a grand 2-story foyer, masterfully-crafted staircase w/ BASKET-IRON BALUSTERS & gorgeous WOOD FLOORING throughout most of the home! Impressive 25 ft. vaulted ceilings in the great room, NEWER CUSTOM AUTOMATIC REMOTE WINDOW TREATMENTS, CROWN MOLDING, & WALK-IN CLOSETS IN ALL BEDROOMS! The gourmet kitchen is a chef's delight w/ GE MONOGRAM STAINLESS STEEL APPLIANCES, GRANITE COUNTER TOPS, 42" WOOD CABINETS, center island equipped w/ a WINE RESERVE COOLER, walk-in pantry & separate dinette area. The dining room w/ TRAY CEILING & WOOD FLOORS will be the showplace for formal gatherings. The large downstairs master suite retreat boasts a bay window overlooking the pool/spa & elegant master bath w/ CUSTOM WALK-IN CLOSET, dual vanities, garden tub & shower w/ a 2nd RAIN SHOWER HEAD. NEWER SUN SHADE ON LANAI, ENERGY EFFICIENT TANKLESS WATER HEATER, LOW-E DOUBLE PANE WINDOWS, 15 SEER RATED HEAT PUMP & A/C SYSTEM, R-38 CEILING INSULATION, RADIANT BARRIER, NEW GUTTERS & 2019 FRESHLY PAINTED WHOLE EXTERIOR! Heathrow is a 24 hour manned gated community w/ playground, basketball courts, ball fields, etc! Top rated schools!! Close to I-4, 417, dining, shopping & biking trails. Property may be under audio/video surveillance. Listing courtesy of COLDWELL BANKER RESIDENTIAL RE. Selling Office: REGAL R.E. PROFESSIONALS LLC.